Danit Peleg is a fashion designer and entrepreneur based in Tel Aviv, Israel. Danit used desktop 3D printers to print the world’s first fashion collection printed entirely from home. The story of making her collection and the potential of printing clothes has captivated the attention of millions globally. Danit is always exploring innovative textiles and loves using new technologies to design fashion. She graduated from world-renowned Israeli Fashion School Shenkar. 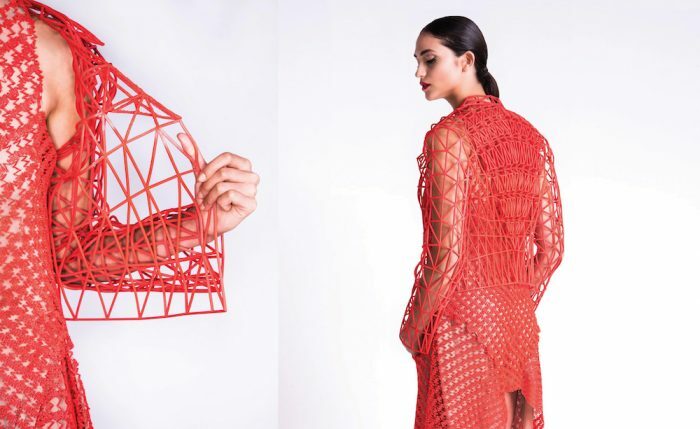 The first 3D-printed fashion collection printed entirely using desktop printers. Danit wanted to prove that it would be possible to print a fashion collection using desktop printers that can be used from home, and not relying on industrial machines. For about a year, Danit experimented with different printers and materials until she found a material called FilaFlex. With this material, combined with a flexible structure, she printed a lace-like textile that could be used to design clothes. With this breakthrough, she was able to print the clothes directly from her home. Printing this collection took a long time – about 2000 hours. As the technology will evolve Danit envisions a world where people will be able to print custom-made clothes from home in just a few minutes. Danit’s inspiration for the design of the collection was Eugène Delacroix’s painting Liberty Leading the People.